DINKELSBUEHL, Germany — Bavaria has more than its share of quaint and colorful towns, but one of the most charming has to be Dinkelsbuehl. Situated between the Romantic Road and the Germany Holiday Route, this picturesque village offers tourists an authentic glimpse into Germany’s past. 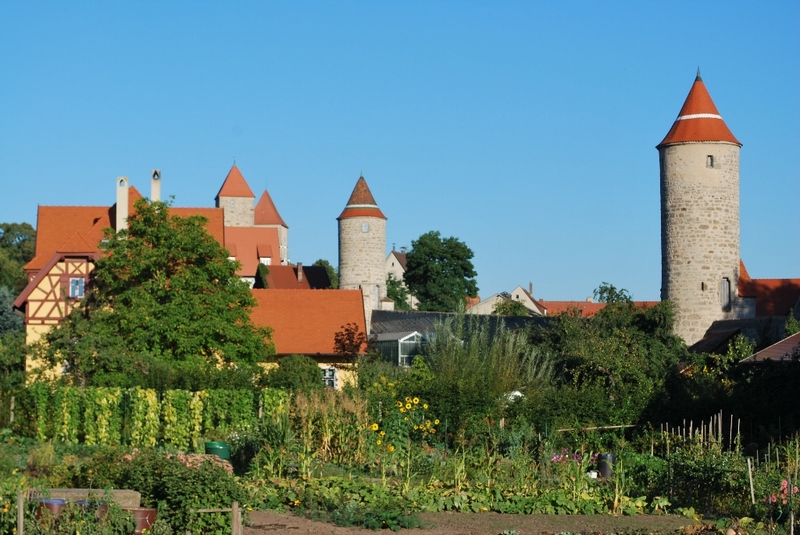 Surrounded by a 1.5 mile wall studded with 16 towers, Dinkelsbuehl is the very image of a medieval town. Less than 20 miles from its more famous neighbor, Rothenburg on the Tauber, Dinkelsbuehl is less crowded and feels more authentic. Nearly half of Rothenburg was destroyed in World War II, while Dinkelsbuehl survived both World Wars virtually unscathed. It also survived the Thirty Years War (1618-1648) with very little damage, despite being under siege no less than eight times. Dinkelsbuehl gave up its status as a Free Imperial City in 1802, but in 1806 the Bavarian King, Ludwig, issued a decree prohibiting the destruction of its walls. Because of its strategic importance along the trade route, Dinkelsbuehl was heavily fortified, and the town’s walls, gates and towers are all still in good repair. Entering through one of the city’s four massive medieval gates, it feels as if you’ve slipped back through time. The best way to enjoy Dinkelsbuehl is to simply stroll along the cobblestone streets and take in the historic atmosphere. With practically every building between 200 — 600 years old, it is a photographer’s dream. First mentioned in official documents in 1188, Dinkelsbuehl is believed to have been founded almost 300 years earlier. It grew up between two major trade routes that over time have morphed into the tourist routes still followed today. This intersection was marked with a defensive tower in the 12th century, which was later incorporated into the massive St. George’s Minster in the town square. This church has been added to, modified and restored through the centuries, but has remained essentially unchanged since the 17th century. Though it appears somewhat bland from outside, the fan vaulting in the interior makes it one of the most beautiful hall churches in southern Germany. It houses several exquisite altars, including the Altar of St. Sebastian which dates from the church’s completion in 1520. Beneath the beautifully painted triptych is housed the macabre spectacle of the sumptuously garbed remains of the martyr St. Aurelius. Directly across from the church, the ‘Wine Market’ boasts five spectacularly gabled houses from the 1600s in a rainbow-colored row, creating arguably the most stunning street in the city. On the corner stands the Gustav-Adolf-Haus, once a weighing house for goods and a tavern for council members, it also lodged such renowned figures as Emperor Karl V (1546) and King Gustav Adolf of Sweden (1632). It now serves as the city library. Just two doors down , the “Deutsches Haus,” with its elaborately decorated façade featuring carved figures and delicate ‘fachwerk’ (half-timbers) is considered one of the most beautiful in Bavaria and even graced a German postage stamp in 2012. It is now a four-star hotel with rooms ranging from $110 – $140 and an award-winning restaurant with a menu featuring typical Bavarian dishes with local ingredients, as well as more exotic fare. Continuing along toward the Rothenburger Tower, you’ll pass the ‘Spital,’ the former hospital first mentioned in 1280. Its delightful courtyard now hosts the traditional Christmas Market every year, beginning Thanksgiving weekend. For a more up-close view of the past, visit the “House of History” museum housed in the 14th century Old Town Hall where artifacts, paintings, weapons and toys from the past 800 years provide context to Dinkelsbuehl’s status as a former center for manufacture and trade. To really experience history first-hand, visit in July when Dinkelsbuehl’s premiere event, the Kinderzeche (Children’s Feast) is held over two weeks. The festival has its origins in the Thirty Years War. In 1632 the Swedish army lay encamped outside the city, calling for surrender. The town council argued for days on what to do, and as the debate dragged on, the army’s commander, Colonel Klaus Dietrich von Sperreuth, grew more and more impatient, finally threatening to loot the city and burn it to the ground. During the negotiations, one of the Swedes’s let it slip that Dietrich was grieving over the recent death of his young son. The gatekeeper’s teenage daughter, Lore, learned of this and approached the city council with a daring plan. The council had agreed to surrender, but Lore proposed that she meet the invading Swedes with a delegation of children and beg for mercy. Every year, the entire town joins in to reenact this legend. With over 1100 costumed performers, the event is a true spectacle. Actors are divided into two troops who trade roles every other year so that all of Dinkelsbuehl has a chance to participate. Performances are held multiple times during the weekends with parades and other festivities during the week. If you miss the festival, you can still visit the Kinderzech Armory which houses thousands of costumes, weapons, saddles, and uniforms in a massive 15th century grain house. “Some of the outfits themselves are hundreds of years old,” said Peter Ernst Kober, manager of the ‘Wilden Mann’ Brewery. Kober plays Colonel Dietrich von Sperreuth during the festival and has been taking part in the Kinderzeche since he was four years old. “This is a very local ‘heimatfest’ (home festival) and we have a real love for this,” he said. Though far less crowded than neighboring Rothenburg, Dinkelsbuehl attracts its share of summertime buses packed with tourists. But as the sun settles and the buses depart, the town takes on a magical quality, the towered walls and narrow streets unchanged for 500 years. As darkness descends, the night watchman begins his rounds, clad in traditional clothing and armed with the customary halberd and horn. Follow him on his nightly march between April and December for a tour of the town by lantern light. There are plenty of hotels and guest houses in Dinkelsbuehl along with a youth hostel that is scheduled to reopen fully renovated in 2015. Many of these buildings have housed guests for centuries. The ‘Weisses Ross’ (White Horse) located behind the New Rathaus (town hall) has been a ‘gasthaus’ since 1645, and the main building dates back to the 14th century. In fact, the rear wall of the dining room once formed part of the original city walls, before their expansion to the current layout in 1380. Joachim Neuhauser’s family has run the Wesses Ross for three generations. “My grandmother had to run it because all the men died in the war,” Neuhauser said, adding that his grandfather bore the dubious distinction of being the first man from Dinkelsbuehl to die in the First World War. Though looking to retire, Neuhauser and his wife still do much of the cooking for their guests, incorporating local ingredients into seasonal specialties. Rooms start at $81 with entrees averaging $12. Dinkelsbuehl offers more than just history. The 3-D museum, located in the picturesque city mill near the Nördlinger gate, showcases optical illusions, holograms and includes a variety of hands-on exhibits. The town is surrounded by some300 lakes and ponds, and there are dozens of idyllic parks, bike paths, and walkways with which to enjoy the beauty of the surrounding countryside. Its stores supply real Bavarian goods rather than just the conventional souvenirs offered at every tourist shop. With two breweries, dozens of restaurants and eateries, and a plethora of hotels, Dinkelsbühl has everything one could need for an enjoyable visit.